SAGINAW GEARS dot com: WELCOME to Saginaw Gears dot com! WELCOME to Saginaw Gears dot com! From 1972 to 1983 the IHL was represented in the city of Saginaw Michigan by the Saginaw Gears hockey club. In that period of time, the team went from a local curiosity to a staple in the fabric of life in the Tri Cities. In fact, the Gears did much more for the community than simply play hockey- they added to the fabric of the lives of everyone who ever bought a ticket. They were a vehicle by which many new friendships and relationships were formed. Indeed, they did much more than just play hockey. For those of you who were fans of the original Gears, this site will be a sort of cyber time machine to take you back to those days at the the Civic Center (now called the Dow Center) and the games that became social events as well as sporting events. Above all this site will serve to kindle memories and document events as they actually happened. Events such as the infamous "streaker" and what really happened will be published here for the very first time. We will look at the Gears and the games from an insider's perspective and discover some things that even the most faithful season ticket holder has never known. Additionally, fans will have the chance to give their input to the stories and accounts that are displayed on this site. From a walk through Zamboni alley to an away game in mid winter to ending the evening in the Blue Line Club, this site will take you back. Thus, if you miss "Those games" all you have to do is visit this site for your Gears fix. For folks who know nothing about the Gears, or their games, this site will provide an interesting look into aspects of another time and a place where a minor league hockey franchise found its way into the heart and soul of an industrial Midwest community. It will be a look into how events beyond hockey influenced the team, its growth and its demise. This is NOT a "stat.s" site! Persons seeking player and team statistics should look elsewhere. 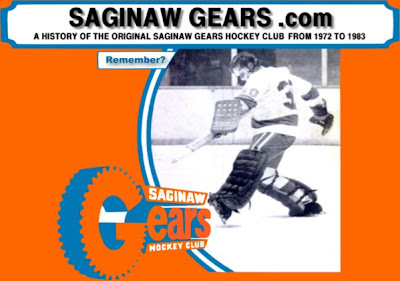 So far as records or statistics for the Saginaw Gears, we will show very little here. There are a lot of stories to be told concerning the Gears. For that reason, this web site will be constantly growing and new cool stuff will be added. It has been the author's experience that once a site such as this is opened and the public views it, tons of interesting items come cascading in from people who were also involved with the team. So, it is fully expected that this site will sprout new and interesting pages as time goes on. Readers are thus advised to keep checking in. So, if you are a Gears fan, a Gears former player or just someone looking for an interesting web site, welcome to Saginawgears.com! Let us start the time machine. All images and text on this site is copyright Wes Oleszewski 2004 all rights are reserved. No part of this site may be reproduced with the express permission of Wes Oleszewski. Ken! Great to have you on the site! And thanks for connecting Ron-Jay up with us too. Now get out there and spread the word more or I'll be forced to post one of those 1970s era pictures of you on the site. I am 43 now. I saw my first hockey game when I was 7. It was at Saginaw Civic Center. My two older brothers took me. I will remember it forever. Thanks for the memories. Wow, I must say, I remember the fights, they were just nuts!! I still have a Gears mini-hockey stick on my work desk. Great site!! I absolutely love sites like this and I'm thrilled that it appears to still be in operation. Keep up the great work!